Call Barbarossa Lawn Care for your landscaping chores. When you are wondering how to make your lawn and landscaping the best it can be, then the call you need to make is to Barbarossa Lawn Care. We will take your questions, and inform you of our basic costs associated with the type of job you want us to do for you. We have the ability to do almost any job as you will find out, and can do everything you need for your lawn and landscaping to look its best. Please feel free to contact us we will be happy to take your questions and assist you in whatever you may need. Barbarossa is the “Best Bang for your Buck” when it comes to lawn and property care! Barbarossa Lawncare has been “the contractor of choice” for our town homes and apartments! 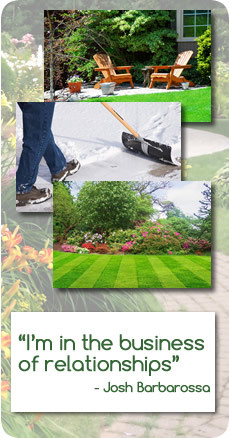 Barbarossa Lawncare has been taking care of all the maintenance on our yard for many years now. They do a great job and are a very friendly company. And their prices are so affordable! I highly recommend choosing Barbarossa Lawncare for your yard too! He is a trustworthy and ‘ethical” individual and businessman…a rarity in today’s society. Over the past three years, Josh and his men have delivered the “Standard of Excellence” when it comes to landscaping and snowplowing services. He is professional, dependable and goes “above and beyond” expectations. His workmanship is impeccable, and highlights the properties he services. BLC does great work. Josh is very professional and we knew the costs up front. We were blown away at the quality of the work. High Recommend! Copyright © Barbarossa Lawn Service. All Rights Reserved.